This is part of the series North America’s Train Stations: What Makes Them Sustainable or Not? Photo of welcome desk looking into the grand waiting room on the right and the former ticketing hall on the left; courtesy of Wikimedia Commons Let me recap the theme of this series: to compete against the car and win over commuters, stations must ease connections between modes. How LA does this matters, nationwide, for it helps build a strategy that breaks transit out of today’s trap of red ink and taxpayer dissatisfaction. 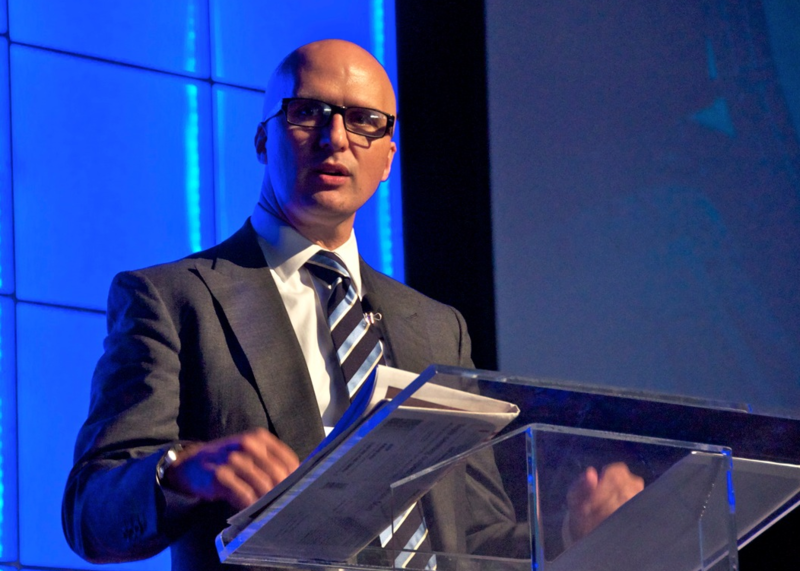 Transit’s case ultimately is economic… and often too technical for the public. LA proves this. To solve both challenges strategically, let me sketch the big picture and put station planning in the economic perspective of there being no money; so, it must be earned. Enhancements for passengers also should give taxpayers value. Taxes are leveraged if car usage fees also are raised to help pay for enhancements. This starts to level the field for overall transportation subsidies and makes transit choices rational in each commuter’s time-cost equation. Each commuter’s rational choice of transit also increases farebox which bumps the public’s investment in transit toward fiscal (operating) sustainability. This creates the positive cycle that eventually earns sufficient public investment for transit systems. 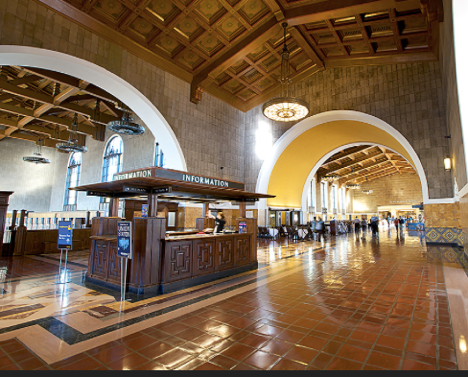 This June 6th, revisions to LA Union Station’s (LAUS) long-term plan were released. On balance, they improve what is already quite good. The flurry of questions about the Plan need some quick transcendence so LA can refocus on its startling transportation transformation whose plot-line is really about reducing the car’s role as the culture’s pig. 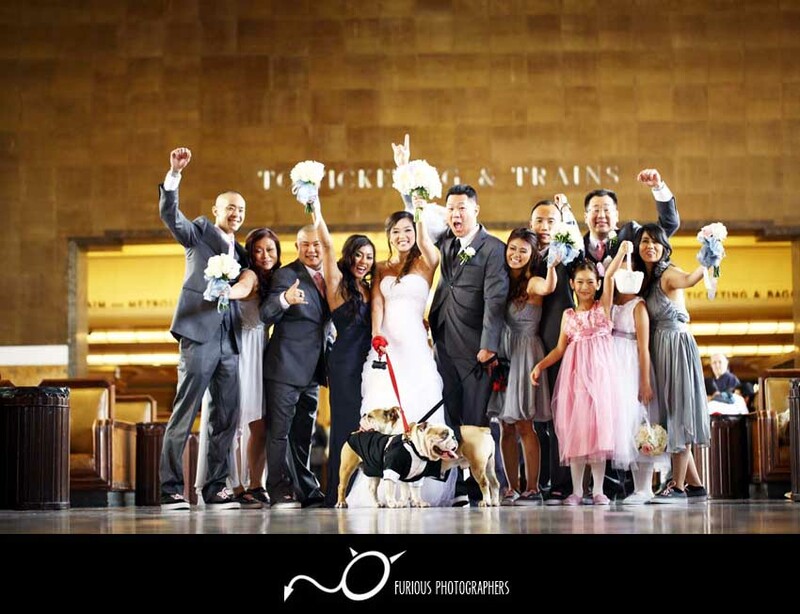 LA Union Station’s plans are an important supporting role. What is most important about LAUS is it reminds me that good looks help… particularly when competing with the allure of cars. 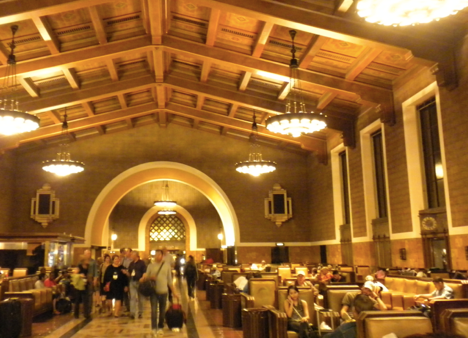 Graced with good makeup on an elegant frame, LAUS is perched in the 4th spot on my list of America’s best-looking grand stations. 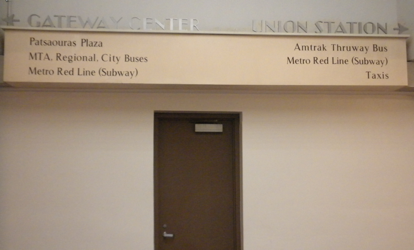 (For the record… the others are Grand Central, Philly’s 30th Street, and DC’s Union Station.) Their good looks correlate to their having this series’ best scorecards for functionality and integrating different modes. And if you doubt the value of good looks, consider Manhattan’s Penn and Chicago’s Union stations…and how they got ugly. As policy came to favor cars, these stations’ owner (the nation’s largest railroad) entered bankruptcy and creditors forced a hasty sale of both stations’ air rights. This resulted in demolishing their good-looking, spacious concourses in the 1960s. Both stations since have functioned poorly; unable to expand as ridership grew. Both have the worst scorecards in this series. LAUS fortunately learned the lesson. Now owned by the LA County Metropolitan Transportation Authority, LAUS has started improving its looks. And its functionality correlates well with the best stations. Those previously-mentioned neo-classical piles were finished by the 1920s. LAUS opened in a different era in 1939. LAUS signaled that railroads had transitioned their trademark to Moderne design. Yet the beauty of LAUS blossoms by blending this early modernism with the region’s historic native and Mission accents. If you search out the refined and exotic, LAUS gives you this eye candy. Attached to LAUS, the formerly famous Fred Harvey restaurant was a destination for star-gazing. While underutilized today only for banquets and occasional film and photo shoots, this hall is being renovated as a first step to making the station a destination again. Photo via herecomestheguide.comTo complement the above serene scene, the LAUS waiting room manages to be both grand and intimate; welcoming all to the nation’s capital of entertainment, glamour, sun worship, and, even, mid-century modernism. In visiting over five dozen central stations throughout the world, I have yet to find a waiting room that I prefer more to sit and contemplate different cultures as the reason why I travel. It helps to sit in a great chair. Great waiting rooms welcome and make good-byes better. In sum, this waiting room glorifies train travel. Waiting room. Photo by the authorSeventy-five years later and countless appearances as a film backdrop to tell personal stories, LAUS endures as cool, yet intimate, highlighting memories and marking milestones. Perhaps this explains why America’s most-populated county chooses this station as a primary destination for wedding photos. Photo via Furious Photographers Blog. See Furious Photographers ubackdrop.And this photography backdrop is from katebackpThis photo emotes me several ways. At a transit point of entry, we see two former immigrant families having arrived at America’s larger destination: adding dynamism, owning a piece of the pie and, we can imagine, prosperously so as small entrepreneurs. 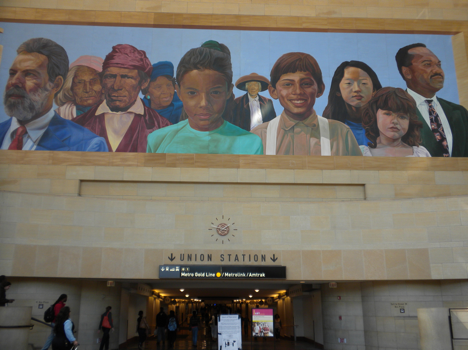 Better yet, we are achieving the transition from the industrial era’s melting pot to President Carter’s vision of “a beautiful mosaic.” This photo celebrates LA’s diversity and exuberance… at a train station… in the city that celebrated cars like nowhere else. Consider this photo as a metaphor for the metamorphosis to sustainable transportation. And this point is worth remembering: these people — and ten million like them — will pay taxes to LA’s transit resurgence and are helping exceed ridership goals on many of its lines. For integrating transit modes, LAUS coordinates well eight transit modes well within two portals connected by a passageway, albeit long. All playing nice are inter-city rail and bus, suburban rail and bus, urban bus and BRT, and urban light rail and a subway. As an example of how good Angelenos have inter-connectivity, consider where it is worst. Chicago’s Union Station makes its customers walk three blocks (add bitter cold four months a year) to enter the nation’s second largest rapid transit system, while urban buses add to the chaos of the station’s streets, creating a hostile environment for the station’s most used mode, walking — often with luggage. Happy to be back in LA, the author took this photo from the East Portal that looks into the central passageway connecting, after 180 paces past 12 tracks, to the light rail and, then, 120 more to the historic station.While the above mural pays homage to those people who will pay taxes and fares for generations, this central view also captures how efficiently LAUS integrates transit’s modes. If this were part of my daily grind, I’d enjoy passing through this glorious sunlit space. Built in 1995, the East Portal is becoming one of my favorite post-modern pieces anywhere. Behind where I stood for this photo, there are 9 urban and suburban bus berths in an efficient circular pattern that is outdoors. (Unusual environmentals for a bus station.) Passengers are guided from the passageway through the portal’s lobby and under the bus circular via a garden-like arroyo; complete with fountains to climb stairs into the circular’s center to wait at one of the nine berths. Ten paces to my left is an artsy entrance to the subway terminus for the Red and Purple lines. (A second entrance is in the historic station). LA’s most-travelled Red Line starts here and runs through Hollywood while the Purple Line serves close-in parts of Wilshire Boulevard, LA’s chief commercial corridor. Straight ahead in the photo are 12 tracks; 3 are for Amtrak trains, 7 more tracks terminate six Metrolink lines and 2 through-route Metro’s Gold light rail line. Four hundred feet to the left is the El Monte Busway station that serves as a center for LA’s growing Bus Rapid Transit ridership. So roughly within an average of about 100 paces, an overwhelming majority of commuters can connect to the next mode in their commute. I’ve described modal connections briefly so you see my summary: LAUS works well now. While there are claims of passageway congestion at rush hour or minor problems in bus operations that drive the Plan’s grand changes, LAUS’s most important goal is to get on a fiscally sustainable path. For example, Metro’s data (page 13) project a mere increase in LAUS bus traffic of 1.5% per decade through 2040. Despite conventional buses being marginal to transit’s growth, the revised Plan wants to build a consolidated bus terminal within a decade. LAUS is the last successful major station built in North America. Seventy-five years later, we have forgotten how to build these. Besides, we are broke. It is too early — and perilous for taxpayers — to dream too big right now. Here are three simple steps to show taxpayers that cost-effective improvements will help LAUS passengers enjoy their experience so they want to return. a. Make a public campaign around improvements and use it to explore themes for LAUS as LA’s latest, best urban center. Comments about the revised Plan indicate the public’s skeptics are on the offensive. In part, this is because capital proposals — in general — are suspected of being tax hikes. But, the larger part is LACTMA has narrow marketing goals. Among recurring weak marketing, an example was during my third study visit (March 12, 2014.) 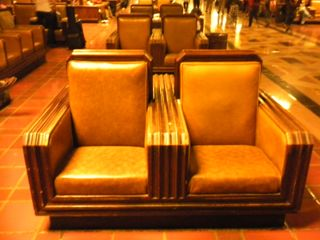 Workers were restoring two of the three large public spaces: the former Fred Harvey restaurant and the former ticketing room. Done by May 3, the station’s official 75th birthday celebration, the restorations are first steps in the spiff-up so LAUS can evolve toward a destination. Yet, I saw no sign telling this to passengers. Because I like rooting around, I did find a list of cosmetic improvements on Metro’s website. Since this involves public monies, there should be a prominent Schedule Of Future Improvements that gives passengers a clear picture of the changes. Put posters wherever relevant. Assume people want to know what is happening to their station. And instead of the 75th Anniversary being weighted toward the past, the PR team missed an opportunity to test themes for future campaigns. To compete with the best, the global center of LA could learn from London. Read this message to patrons of a Underground station in a poor neighborhood. A simple sign can make Angelenos believe their temporary inconveniences are part of something big. Photo by the authorIf the Mayor of London (a Conservative) can show concern to the inconveniences of poor people, then LA’s adoption of a better customer attitude can be an early stepping stone to transit economics that work as well as London’s. b. Make a suitable Light Rail entrance. The conversion of the platform closest to the historic station to light rail should give reason to pause. The Gold Line light rail is projected to have 47% more riders by 2040. This is one-third more growth than LAUS will get from the far more expensive and capital-intensive subway extensions. So if the Gold Line is so economical and important to the future, why does it have such an un-inviting entrance below? Only two signs indicate the Gold Line entrance/exit before ascending to the platform. Note how the lightly-used elevator dominates the station. Author’s photo.Instead of almost hiding the entrance, why not announce it with anticipation by using a gold signage theme starting at both ends of the passageway? And where are the signs indicating when the next Gold line train leaves? Metrolink lines have them. Why not put a second Gold Line entrance/exit here? All other platforms have two. Photo by the author To counter the impression that I am a LAUS partisan, these two photos capture one of LAUS’ few design botches. All train platforms were designed in the 1930s to have two entrance/exits that flow passengers into this passageway. Instead of a second ramp to the passageway, the Gold Line got the above wall. The Gold Line station is the only major addition to LAUS in this Century and it is a botch. I’d like to know why this wall can’t be broken and the platforms above re-extended to make a second, better entrance/exit to the light rail system. Once they get this correct, I’d feel better about LACTMA using tax money to convert the passageway into a spacious concourse as now proposed in its long-range Plan. In fact, use the remake of the Gold Line station as a way to prove to the public that a new concourse will end up as a good investment. c. Upgrade the passageway and install moving walkways. LAUS rush hour crowding is laid-back compared to Manhattan’s Penn or Chicago’s Union stations. Nonetheless, increasing traffic at LAUS could crowd the passageway within two decades. Instead of the proposed concourse, consider a cost-effective solution: within a year, a moving walkway could help handle rush-hour capacity. Prominent in sprawled airports, moving walkways would tell rail passengers they’ve got status. Don’t forget marketing…. Imagine this passageway with some simple cost-effective decorating (with color-coded signage based on modes) indicate that LAUS is a unified station serving all modes better? 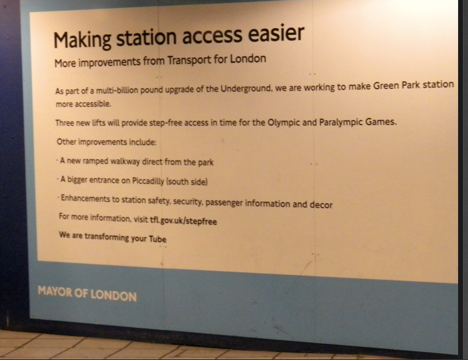 This type of strategic decorating also can start testing LAUS themes as a daily urban destination that people want to go to. Photoshopped, this is the proposed decoration of the passageway that should be completed soon. 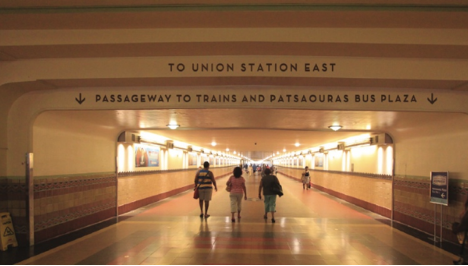 For details of Metro’s Wayfinding and Signage project, find this photo on page 21.As it gets the small things right, LACMTA’s Board should get a healthier fiscal perspective on long-term proposals to enlarge the passageway into a concourse. For sustainable transportation, better trumps bigger. While suburban trains mostly support suburban lifestyles, greater efficiencies are key to accelerating cures for suburbia’s auto-dependency. Suburban rail Metrolink’s six lines terminate at LAUS. Along with Amtrak’s Surfliner, they are projected to double their LAUS passengers by 2040; making it the best mode to bring in suburbanites to show-off LA’s burgeoning urbanism. Run-through tracks (LACMTA’s phrase) claim to improve efficiency by 40% and shorten average travel times by 8 minutes and much more for transfers. Through-routes are absolutely essential infrastructure that is long overdue. Last year, LACMTA proposed a comprehensive Southern California Regional Interconnect Project (SCRIP) that called for eight run-through tracks. They wanted to start construction by 2017 with budgets of $350M. But, initial bids came in high. Today, the revised Plan acknowledges only 4 tracks for the same price. This must be explained. Despite its power and competence, LACTMA is not in a strong position to through-route completely. LACTMA’s focus is to expand LA County’s Metro, instead of distractions from the awkward 6 county collaboration running MetroLink. With no strong authority for regional collaboration and SCRIP’s scope halved, strategic marketing helps LACTMA here, too. If it rewards those lines that generate the most revenue by through-routing them first, LACTMA turns a blundering cost-overrun into a viable plan to maximize public monies while eventually completing the original eight through-routes. This creates a dynamic in which suburbs compete to plan for more Transit-Oriented Development. The necessity to through-route — and its expense — can be turned into a contest to redevelop more compact TODs. This principle of faster pay-back seemingly exists already in LACTMA’s investments to improve train stations and TOD within LA. Instead of trying to bury the sourness of half as many through-routes, shifting to principles of economic and fiscal sustainability could win the metropolis its biggest long-term victory against the car. 3. Propose that Amtrak build its own station. LAUS will evolve better if it has fewer requirements imposed on it by Amtrak. Those of us who see how Amtrak shares central stations know it is not the best collaborator. Amtrak has different needs than commuters and this often creates unnecessary problems. Many examples at LAUS and especially elsewhere prove Amtrak adds unnecessarily to the complexity and costs of busy stations. The most visible example that LAUS commuters grasp is Amtrak vehicles create flow problems for the other 99% who do not need a truck to carry their luggage. Commonly two or more of these trucks meet Amtrak trains. This is not altogether an invasion of pedestrian space, but does not show much respect for it either. Photo by the author.Amtrak complicates the confusion in the mixing concourse between the tunnel and historic waiting room. Amtrak parks its luggage trucks there so they can shoot down the tunnel. These trucks show, in little ways, how Amtrak throws its weight around. To avoid sticking LAUS updates with Amtrak-related costs and delays, I suggest that enough of LAUS’s large site be given over to Amtrak to build a station to its specs. Even though Amtrak’s role in the highly contentious High Speed Rail is not known, the revised Plan puts the High Speed Rail station to the east of the East Portal; establishing that inter-city service, at least, can be separate. Good start. If I were on LACTMA’s Board, I’d move that Amtrak decide where it wants to build its concourse based on the latest plan. If Amtrak demurs, at least it might play nice in someone else’s house. 4. Create a redevelopment structure for the station and its surrounds. Easier said than done! It will take a decade for a suitable development organization to finance its first deals evolving LAUS from an isolated transit center into LA’s newest urban center. LAUS’ extreme isolation is unique among major stations. The red-tiled roof is the land-marked LAUS with its exquisite Waiting Room running left to right. To its right starts the 270 pace passageway; tunneled under the north-south building (probably demolished for a bus station) and continues under the tracks to the semi-circular East Portal (currently the main bus station and larger subway entrance.) The tall building lording over the complex is the HQ for LAUS’s owner, LACMTA, the Los Angeles County Metropolitan Transportation Authority. Photo via WikiMedia Commons.LAUS is quasi-barricaded from its surrounds. Foremost is the ten lane Highway 101 as its southern border. Further complicating the 1/4 mile pedestrian shed is large swaths of urban desolation. Almost half of it is warehouses, train yards and a cemented river. Much of the rest has a few government buildings, seemingly plopped without more purpose than filling up land given a bad reputation by its former industrial uses. The only residential was built recently on LACMTA’s site, and many of those units will be sacrificed to the proposed bus station. The 1/2 mile radius continues this limited mix. As a positive, this larger ped-shed includes City Hall. Its civic center park remake indicates LA is understanding how to make walkable urban areas. Also boosting its fledgling urbanity are the destinations of Chinatown to the north and Little Tokyo to the south; each being the next stop on Metro’s Gold Line. The dashed green line below is the 1/2 mile radius. Map from Metro’s Community Linkages Study for Little TokyoThe mile radius has more of the same: warehouses, rail yards and cemented river. Walkable grids get mangled by merger ramps from two Interstates. Residential redevelopment gets complicated by public housing projects and other under-served neighborhoods. But adding an important positive, employment (other than government) is provided by two medical centers. More important is how Central City East (just south of Little Tokyo) is quickly gentrifying with young people who are active participants in the first generation to use transit more. Information Age workers are replacing the winos on the former Skid Row. But in sum, urbanity still is not yet healthy in the surrounds of LAUS. Integrating LAUS can be sped-up because LA’s land use laws are changing. To improve transit ridership, Mayor Villaraigosa started experiments with ordinances to make LA more compact, particularly along corridors. He seems to have done a good enough job that the momentum of a comprehensive corridor code probably can continue without his leadership. While important in remaking LA’s picture of itself, these ordinances still only have produced more leaps of imagination than bounds into sustainable urban redevelopment. The surrounds of LAUS may be LA’s key test of its ability to leap. Even if physical and land use obstacles are overcome, another strategic obstacle is organizational: transit agencies are cumbersome partners to private redevelopers. Despite its strengths, Metro still proves the rule and its parent, LACMTA, seems to avoid solutions. Two years ago, a Public-Private Partnership and the fad-ish “value capture” scheme were proposed during LAUS’ initial long term planning. But, both were dropped from the 2013 Master Plan. This is inauspicious… and hard to understand since LACMTA owns 45 acres — plus air rights — and influences much more that could produce a great urban center. LACMTA must set-up a practical process to develop effective public-private ventures if it expects LAUS to evolve into an urban center. If as great a businessman as Mayor Bloomberg has to face failure at Penn Station, LA’s chances seem slim without innovation. Amidst the abundant efforts nationwide to revive central stations, integrating them into an urban fabric is a common challenge to many Sunbelt municipalities. Most know that if they do this right, other factors for transit can more easily sync. A workable framework for redeveloping economically around LAUS does much to enhance LA’s example for Sunbelt cities. But, that leadership also must develop fiscal responsibility. Maximizing the assets it has — its current station in particular — is key to minimize operating costs in a new, fiscally sustainable regime. I love Union Station, I’ll admit I’m a partisan when it come to it, albeit since I’ve left LA I’m one of those Amtrak users that slows all of the commuters down (sorry guys.) I think you’ve outlined a few of the issues it does have. In terms of the neighborhoods surrounding it, you failed to mention Olvera St, right across Alameda from LAUS, and a historically designated space that complicates development. At the same time, it’s a beautifully preserved walkable historic district in itself. The key I think for the neighborhood would to be better connect Olvera with the station by somehow making Alameda more crossable, which I think would require routing it underneath a pedestrian plaza. Second, I think mixed development up toward and around Phillipe’s (another LA landmark of sorts) should be easily accomplished and then you would have an urban gateway that connects and utilizes several existing assets. The City and LAUS are already working on narrowing Alameda to connect the station to Olvera. And there are moves afoot to make the in-front parking lots into urban spaces. All this is good. However, the good is limited by 101 dividing the station from the Civic Center and the older downtown. Highways continue as the bane of transit and stations. I didn’t mention it in the article article because it is speculation: but I guess 101 is the primary cause of through-routing costs doubling; having to raise tracks up to 3 feet to accommodate 101 trucks. Transportation cannot be sustainable as long as vehicles have priority. I have used LAUS a few times as a passenger. I love its scale — not monumental — as well as its history. Its situation in downtown LA also works to its advantage. I certainly agree, by comparison, that LAUS is an exemplar when contrasted with the sad-sack circumstances of NYC’s Penn Station and Chicago’s down-at-the-heels Union Station. YES, providing LAUS with enhanced access to Light Rail would be another step — long overdue — toward making it function as a genuine transit village. It’s not clear to me, from afar, what makes the station a destination. Most airports are not, except for hotels and business meetings. They are places where you land or take off from, moving into the city from there. Most commuter stations are simply way points on the trip between home and work, with little “friction” or stoppage en route, even in a place like Grand Central in New York. I love this station, having gone through this on my way to college in 1976, stopping in the outdoor courtyard while laying over. But on every other trip I flew into Ontario or LAX and then passed on from there. With so many competing urban centers in LA (downtown, Santa Monica, Pasadena, Long Beach, etc. ), I don’t see the adjoining area becoming the Manhattan mid-down of the region. My view of the future is that most urban places will become more like urban villages, a mix of work and housing. What’s the vision for how this place will actually work and function? When it comes to the people living and working in the region, what will get them to linger inside the walls of this particular place? I’d like to see it used, but I don’t get the vision. Just looked at the master plan, and it is surprisingly free of contextual analysis. And yet a very cursory review of Google Maps shows that Los Angeles Plaza Park and Olvera Street, the historic heart of the region, are directly across the street from the old station building, immediately to the west. As I look at the open spaces and greenery in those adjoining areas, I have to think there is more opportunity to integrate these places together, bringing the outside in to what is otherwise simply a lot of concourse areas with high-rise office and hotel buildings plunked down in their midst. If there is genuinely a goal of “place-making” here, why not start with that original place, the plaza, and build from there? The main selling point of Los Angeles is its weather, the fact that you can be outdoors almost all of the time. 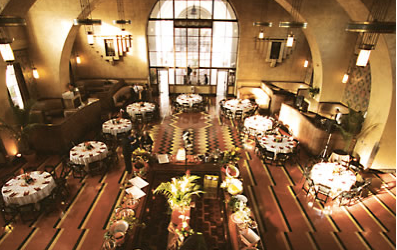 (The old station waiting room and Harvey House restaurant space were dark refuges from the sun.) Given this outdoor living, why not build on the existing network of plazas and paseos to the west? The proposed plan is much more like a modern airport, a place of interior concourses and moving sidewalks. I have a composer acquaintance who staged an inventive, contemporary opera there last year that was nominated for a Pulitzer (Invisible Cities,) I can think of no other transit center that has that distinction. So it certainly can be a multi-functional arts space, and also a tie to a distinct cultural genre that Los Angeles is well known for. I think the question is how do you integrate this with the multi-ethnicity of the surrounding area and not tie the space too much to its history so it becomes just a backwards looking museum rather than a forward looking part of the city’s culture. It needs to be a tie to the past rather than just a relic, and I think that’s the challenge. Although I hail from the Pacific Northwest, I find LA infinitely interesting. It is the future in so many ways, especially on the artistic front. The challenge here is how to take a really, really classic asset from the past, the station and its garden, and integrate it into the city so it is more than just an airlines concourse or a bus mall. That’s why, when I looked at the map, I was surprised to see the old plaza right across the street. Despite the neighborhood being sliced and diced by freeways and big institutional office buildings, it seems like there must be some way to integrate LAUS with this great stuff to the west. I know that area is touristy, but it also has the base DNA of LA- plazas and paseos. Err.. Philip Marlowe the detective, not Christopher the playwright. My bad. The interesting question, per the word of the moment, is how you make places like this “sticky”, so they’re more than something you dash in and out of or to and then back out. Nobody has really made an aerotropolis with character. This building has it, but how to add anchor tenants with character? Fort Mason, in SF did this. Harder when the place is inherently transient. 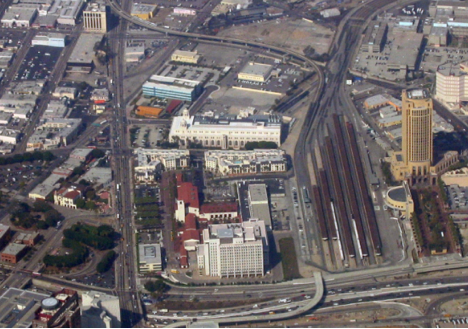 Question: the Downtown LA office clusters is reasonably close to Union Station, but is separated from it by a freeway. Now that the through-tracks project is going to build a railroad bridge over the 101, is the city considering also including enclosed pedestrian access? 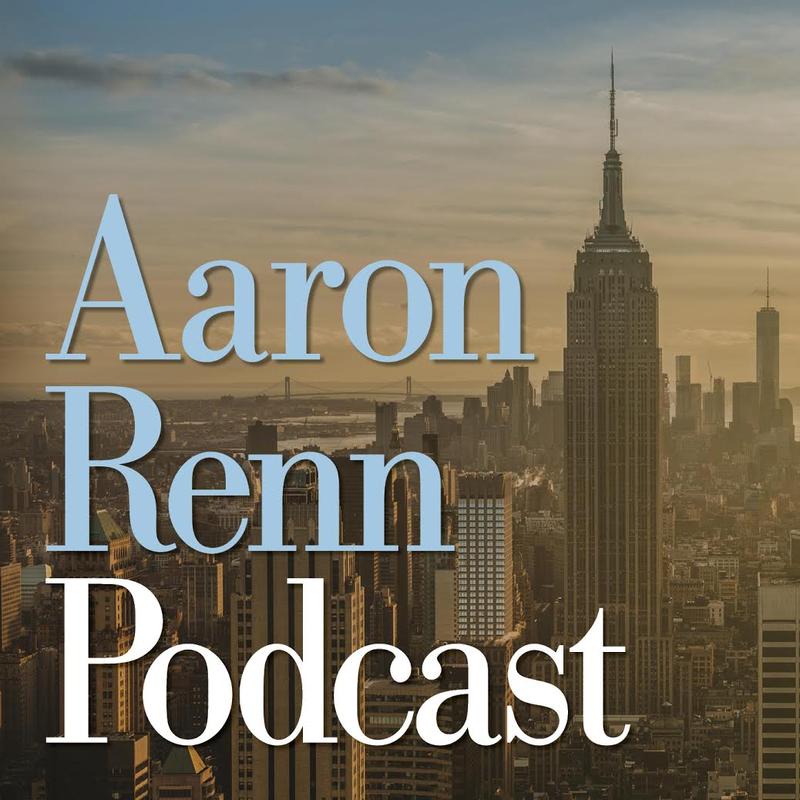 This is a top-rate discussion because it helped me focus on the two key strategic issues. Thanks. 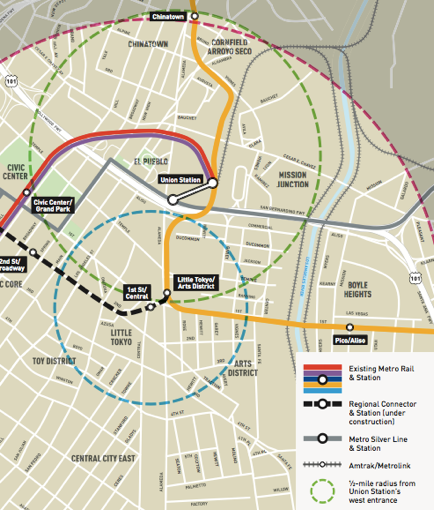 Second, through-routing could be LA transit’s political turning point. If my speculation is even half-correct (that trucks on U.S. 101 require raising the tracks 3 feet and this has doubled the price of through-routing), then LACTMA should fight to protect taxpayers against the trucking industry. Returning to our first strategic key of turning LAUS into a destination… LACTMA must admit its limits for putting together complicated deals. Turning LAUS into LA’s global center requires flexibility that diverse political appointees will never have. Solution: try a PPP-like experiment and delegate special powers to a Redevelopment Corporation. To summarize the summary… handling these two opportunities are the future of LA’s transportation in two Hollywood high concepts: fight trucks as if they were the Evil Empire; and “Get Smart” about redeveloping this movie set for trains. The “movie set” for trains is a very interesting idea. When flying was new to most people in the 1960’s, there were observation decks that made a trip to the airport exciting for those doing the drop off and pick up. This proposal seems to bury the trains, but what if their arrival and departure became a kinetic part of the set piece, rather than the connecting concourses that usually get lined with news agents and fast food stores? Do a Google Images search for Wuhan and “Chinese high speed station” and you’ll see a 21st century place that any of us would be eager to enter. Cross that with the place-making aspects of the Grand Central waiting room and you’d really get theater, the kind that would truly brand L.A. as a global center of innovation. If the essence of Southern California is movement, why not put this front and center? Yes, most of the movement will be commuter traffic. Why not add drama to that? Let’s help LA a little and think about how to combine your two ideas: LAUS as a destination is really a promotion of the movie industry that is organized as a pedestrian corridor. So as pedestrians watch trains go by, in-between those windows are movie posters and paraphernalia. If people want to study an item, they get off the moving walkway. Consider it a free tourist museum… and something for commuters to do while killing time between trains. I think the movie industry will be glad to fund this self-promotion. And LACTMA, being an agency, will learn more clearly about how PPP-like ventures can help transit’s cause. Most of the area that would contain these two or three movie/train corridors are already slated for redevelopment. So maybe in a mixed-use urban environment…. we just germinated LA’s next new theme park for family fun ! My last comment reads as if I am still jet-lagged. But the concept is to redevelop the southern border of LAUS and make multi-purpose pedestrian corridors that are part of the “destination” of celebrating LA and movie Americana. This all should be self-funded from the mixing of uses. Incidentally, the City and LAUS already have rough plans for the western side of LAUS. These plans seem to need a destination theme and purpose. Testing the conservation/sustainability themes here will learn lessons for the corridors on the south border and towards the Civic Center. The real issue to me is the west side, and how you take the site and make it part of a larger place. When, after a 24 hour ride down the coast, I had a lay-over at Union Station, it was the outdoor courtyard and fragrant trees in it that most struck me, that inside/outside element of L.A. Instead of centering this place over the railroad tracks, why not extend the wonderful grid of outdoor places from the plaza and Olvera Street over and across this place? Unless you do that, you end up with a very airport-like development. What makes Grand Central work is the fact that the platforms are under the main hall, and that that hall is accessible from every direction is a giant living room for the city around it. The plan for LAUS is much more like the concourse layouts at Denver International, which are essentially moving sidewalks to the gates. Thanks and you are correct about the west side being the first, easiest and more prominent area to redevelop because much of it will become better open space. LA is on this. Because LACTMA is an appointed Board, their chances are not good enough to make good business decisions that also protect taxpayers. As for the concourse, the long-term plan of widening and opening up the passageway makes sense to me in the long-term. All I’m saying is: let’s correct the light rail station that is in the middle of the concourse and is the mode that will grow fastest for the next decade. LAUS — like the transit system — has to prove it is worth the public’s investments. It has started out badly by giving light rail a botched station and, now, by doubling the cost of through-routing. Until it deals with these two debacles adequately, LACTMA (as good as it is relative to its peers in other cities) needs to setup a better structure to guide the redevelopment of LAUS. How much is through-routing costing, anyway? My recollection is that the price tag is $400 million, which is a lot cheaper than the cost of electrifying Metrolink, without which a lot of the benefit of through-routing can’t be realized. Regional rail modernization includes high off-peak frequency and urban infill stations; diesel locomotives impose too high a marginal cost at less busy times, and take so long to accelerate that infill stations would reduce average speed unacceptably. As for the pedestrian experience, I’m talking less about how each street looks and more about the need to cross the 101. I’ve never been to Downtown LA, but what I saw of Wilshire around Vermont and of Hollywood around Western seemed good enough. The problem is that between the office buildings and the station there’s a freeway, and there’s no real demand for office space on the station side of the freeway.